My bread-making hiatus is over. Two weekends out of town does put a crimp in domestic pursuits, especially baking. 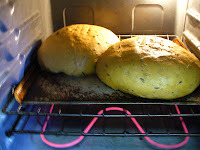 Ditto for an allergic reaction to Italian Walnut-Raisin Wheat Bread – my most recent culinary triumph. But I couldn't post about it -- I was too busy taking hits off my inhaler. Let me clarify: It wasn’t actually the bread. More like the walnuts. 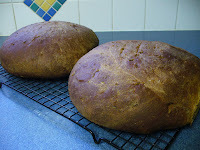 Which was unfortunate because it was a damn fine batch of bread that I would probably make again. If only it didn’t send me into acute respiratory distress with each slice consumed. Ah, the sacrifices we make in the name of health. And an interesting postscript (well, at least to me): This new-found sensitivity seems to extend beyond walnuts to the entire nut family. Needless to say, two inhalers later, I am now living in a nut-free zone. And hating it. ANYWAY. 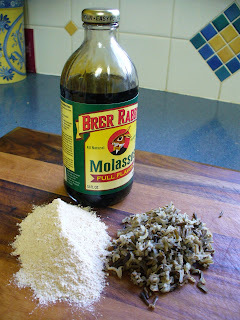 I perused “The Bread-making Bible” for a worthy substitute and came up with Wild Rice-Molasses Wheat Bread. Yes, the ingredients sound a little bizarre, but oh mama, this is good eating. I think that whole cube of butter the receipe calls for might have something to do with this. 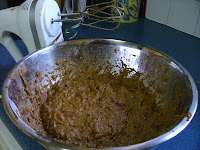 First you mix butter (melted), molasses, whole wheat, warm milk and yeast mixture together. Yes, I know it looks like poo -- but trust me, it's much more pleasant in person. 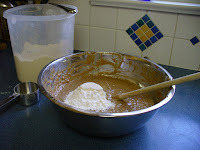 Then you start adding flour -- just 1/2 cup at a time. Your goal is "tacky" dough. Love it! How trailer park. I'm sorry. That just slipped out. Won't happen again. Two risings later (in the laundry room, of course -- darks and whites done, thank you very much), our loaves of love are ready for the oven. And 45 minutes later, perfection. Seriously.